This week’s favorite song is called “Night That You’ll Never Forget”, by Love and Theft. This song is just really catchy. I love the lyrics and it’s a fun little song about just hanging out and having a good time. Happy Friday! Mike and I just discovered that through our Dish TV service we can rent tons of free movies. I know, we’re a little behind the eight ball on that one. It took forever to download, but we decided to kick off our free movie fest with The Conjuring. Plot Summary: (from IMDb) In 1971, Carolyn and Roger Perron move their family into a dilapidated Rhode Island farm house and soon strange things start happening around it with escalating nightmarish terror. In desperation, Carolyn contacts the noted paranormal investigators, Ed and Lorraine Warren, to examine the house. What the Warrens discover is a whole area steeped in a satanic haunting that is now targeting the Perron family wherever they go. To stop this evil, the Warrens will have to call upon all their skills and spiritual strength to defeat this spectral menace at its source that threatens to destroy everyone involved. This movie was just ok. As far as horror movies go, it was a little predictable – you know, the haunted objects, the demonic exorcism, etc. That said, according to the introduction, it is based on a true story. There were some good, make you jump a little kind of scenes, but all in all, it was a little disappointing. I think the ending (I won’t spoil it here) was the most disappointing part. I have very seriously enjoyed every facet of owning a horse. Sue has his own silly little personality. Like any young creature, he likes to test his boundaries… everything from nibbling on my arms to pushing on me with his nose. He tries it in the arena (“You want me to run? I’ll show you run!”). For me it’s been a learning lesson because I’ve had to learn the basics about horses and their behavior as well as the ins and outs of riding. My trainer is one of the coolest people ever, but she challenges me. A lot. I love that, even though it’s hard and sometimes uncomfortable. Dana gets me and helps make me a better rider, even on the days we don’t ride and just do groundwork. A couple weekends ago I had a ride that started off rough and then felt like everything that could go wrong did. When I tried to mount up, Sue started a little bit of bucking, which scared the daylights out of me. Lesson 1 of the day: pay attention to your horse when walking to the arena… if the cinch (the strap that goes around their belly) is pinching at all, climbing up in the saddle can hurt them, causing bucking. After that, I lost a bit of confidence and by God, that horse knew it. He tested me at every chance (didn’t lope when I asked, stopped when I didn’t ask, etc), but we made it through. I went home feeling like the worst rider in the world. I went back for a trail ride the next day and everything fell back into place. Over the last two lessons, things have just clicked. I feel like Sue understands what I’m asking him and actually wants to do it. We had one of the most wonderful lopes around the arena that I’ve ever had with him – we made it four or five times around before I asked him to walk. It was just one of those blissfully good rides. I still find a lot of solace at the barn… when I’m there I don’t worry about other things in life. I don’t think about what’s for dinner or that email I have to send when I get home. It’s just me and Sue. I’m learning to be the alpha with him and it’s been really fun. His stall is right next to his mama’s (her name is Banshee) and she neighs every time I take Sue out or bring him back in. I sneak her treats for being a good mama. Life is so darned good! 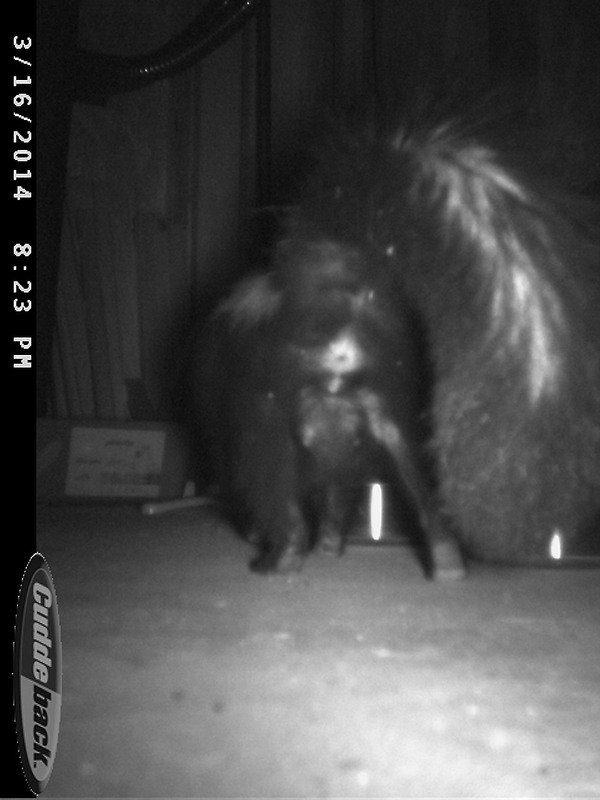 Since we let the barn cats out of their pump shed home a couple weeks ago, we have had exactly two sightings – one of Charlie down the road and one of Kenzie on the bank out front. 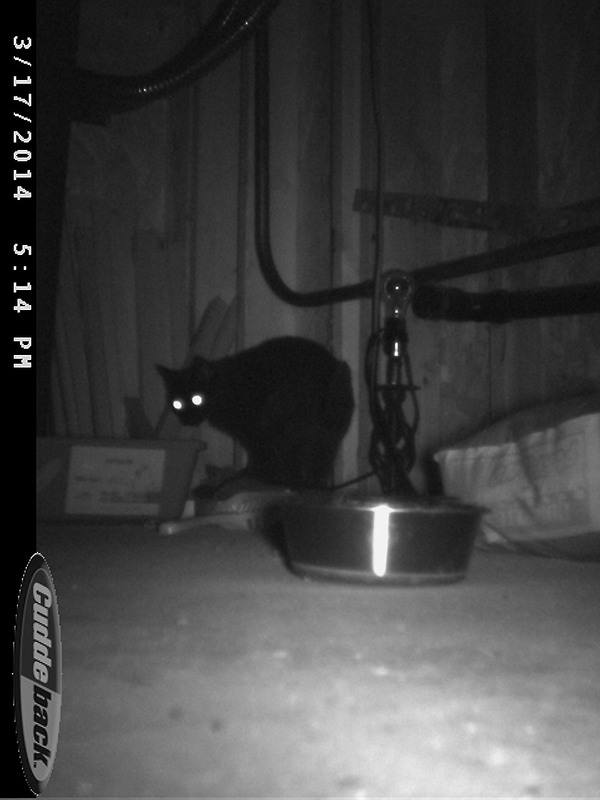 I’ve been putting cat food out to make sure they had something to eat, but wanted to see if it was actually them coming to chow down. To be honest, I’m not exactly sure what to do about this. 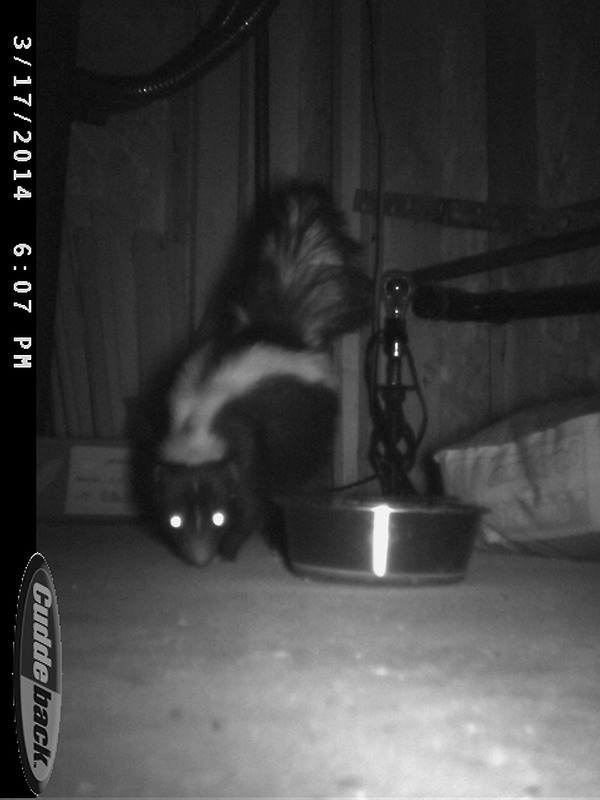 I can’t not put food out, knowing the cats are relying on it, but I definitely don’t want to feed Purina’s finest cat food to a skunk. Nor do I want to encourage one to hang around. 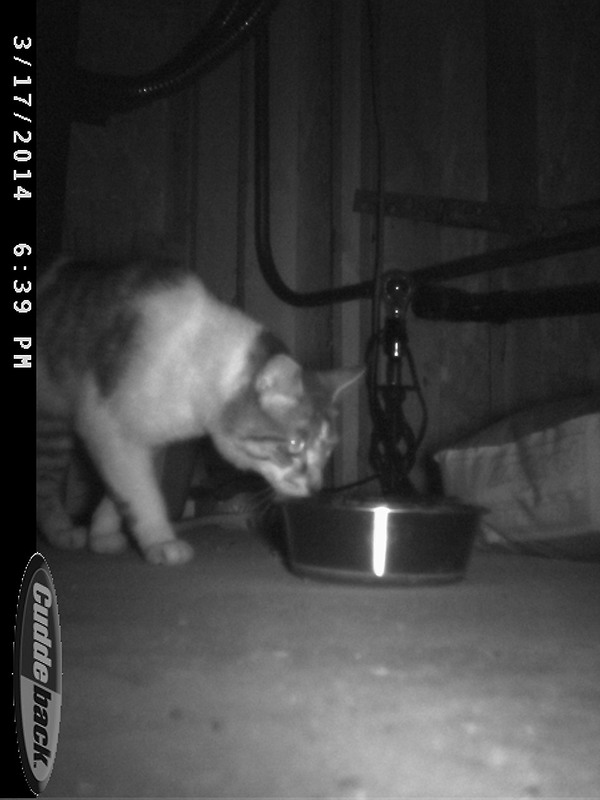 I put some more food (and the camera) back out tonight… fingers crossed we just get cats this time!